The 2,496.87 cc (152.368 cu in) straight 8 (76.0×68.8 mm) gave 257 bhp (192 kW) at the 1954 French GP which was its first race. During 1955, this had increased to 290 bhp (220 kW) at 8,500 rpm. 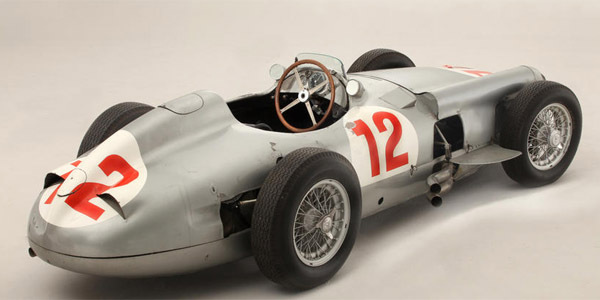 The 2,981.70 cc (181.954 cu in) sports car (78.0×78.0 mm) gave 310 bhp (230 kW) at 7,500 rpm and was a bored and stroked version of the F1 engine complete with desmodromic valves and fuel injection. Variable length inlet tracts were experimented with and four wheel drive considered. An eventual 340 bhp (250 kW) at 10,000 rpm was targeted for the 2.5-litre F1 motor. All versions used well triangulated spaceframes of round-section tubes. The diameter of the drum brakes was too large to allow them to be fitted inside the wheel rims, so they were fitted inboard front and rear, with short half shafts and two universal joints per wheel. Torsion bars, fitted inside the frame's tubes where used in the double wishbone front suspension and the rear suspension, which featured a modified swing axle, with long arms and a low pivot point for each side, the pivot points near the other side wheel, not unlike later Ford's Twin-I-Beam type front suspension, in an effort to overcome the undesirable camber changes of swing axle suspensions. Nevertheless, as cited above, nasty snap-oversteer was not eliminated.